More than half of all respondents, 56%, who said they faced a problem in the past two years identified one of three matters: health care, paying for health care and government benefits such as Social Security and military pensions. Parsing that further, the responses from Americans who have high access and low access to the internet diverge. Those with low access to the internet or no access at all are half as likely to identify some other problem in their lives, at 14%, as high-access internet users, at 30%. And they are twice as likely to simply not identify a problem at all. Reflecting that the low-access group is more likely to be older, 54% of them report that they or someone in their household receives Social Security benefits or is covered by Medicare, compared with only 23% of the younger, high-access group. Breaking the low-access group down further, 32% of those with dial-up internet access are receiving such benefits, while 62% of those with no internet access are doing so. In terms of other types of government aid, which tends to be administered by the state or local government, 21% of the low-access Americans say they are receiving benefits, compared with 14% of those with high-access. Aside from the self-evident differences in internet use, the low-access group approaches similar resources for addressing their matters and solving their problems as the high-access group. Only their use of television and radio is different, where 21% of the low-access group rely on TV and radio as sources of information or help, compared with 14% of the high-access group. The low-access group is also much less likely to say that in the future they would use the internet to help them address their matters of concern. Those with low-access to the internet share similar opinions with high-access internet users about the state of the nation and the trustworthiness of others. There are a few attitudinal differences: For example, those with low-access are less likely to be satisfied with how things are going in their community, 64%, compared with 71% of respondents overall. Low-access Americans appreciate the new glut of available information as much as high-access internet users: two-thirds, 65%, of low-access Americans say they like having so much information, just about the same as the 67% in the population at large. This willingness to deal with the flood of information is also reflected in the media use patterns. Low-access Americans are just as likely as other Americans to say they get information from television, radio and magazines. They are a bit less likely to say they get news or information from newspapers (79% v. 85%). And not surprisingly, they are a lot less likely to say they get news or information from the internet (29% v. 53%). Those with low-access to the internet report dealing with fewer problems on average (a mean number of problems of 1.7) than those with high-access (2.6). This is almost certainly because those with low-access are older and thus less likely to be dealing with a number of the matters identified in this study, such as education for dependent children and changing job situations. Those in the low-access group who do identify a problem they addressed, report using a slightly smaller number of sources as they try to address those problems than those in the high-access group (a mean of 2.5 sources v. 2.9 sources). This suggests that the lack of good access to the internet could have an impact on the scope of help available to them. Those with high-access to the internet are more likely to report being very successful in their searches for help, 63%, than those with low-access, 54%. Broken down further within the low-access group, 61% of those with dial-up internet access said they were very successful, compared with 50% of those with no access at all. How the low-access group uses the library. 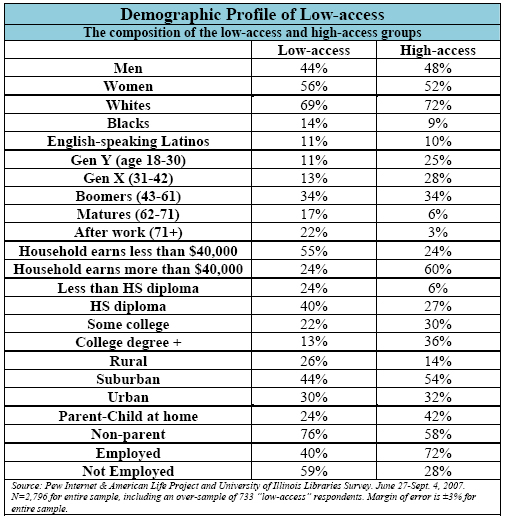 The low-access group is potentially a core group of customers for the nation’s public libraries. Although they are less likely in general to use the library than the high-access group (39% v. 61%), those with low-access are equally likely to turn to the library for help with their problems. Some 12% of those with low-access do that. Low-access people were slightly more likely to seek help from the library staff (75% v. 66%). The low-access group also sought more information or help from other people besides the library staff, 13%, than did the high-access group, 2%.